“There should be a better place to rate this company…they are not selling day tours in Santiago, but rather 6-35 day organized walks to get there. At any rate, I used Camino Ways for a trip in July, and found them EXCELLENT. It was an unguided walk with hotels, luggage transfer and some meals (breakfast incl, and an optional dinner package). We did 2 segments on the French (traditional) Way. The first St Jean-Pied-de-Port to Estella, I upgraded the hotels, and was quite pleased with the results. Meals were better as well, I suspect. Luggage transfer was perfect, also the transfer from Biarritz Airport to St Jean on Day 1. 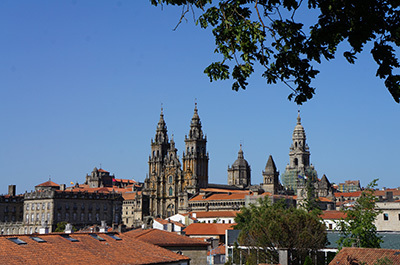 The other segment we did was from Sarria to Santiago (the final 115 kms. required to get your certificate). I did not upgrade these hotels, and would not if I were to return….they were quite adequate, several even pretty good. Again luggage transfer was seamless. We were provided with detailed trip notes for each walking day, which were quite helpful, though the Camino is generally well-signposted. Before our trip, my various e-mailed questions were answered rapidly and efficiently by Camino Ways staff.